A new paper published in Astronomy & Astrophysics finds that solar activity may be influenced by gravitational torque from the orbital configuration of the planets. In addition, the authors show that solar activity during the 20th century was at the highest levels of the past 9,400 years. Context. Understanding the Sun’s magnetic activity is important because of its impact on the Earth’s environment. Direct observations of the sunspots since 1610 reveal an irregular activity cycle with an average period of about 11 years, which is modulated on longer timescales. Proxies of solar activity such as 14C and 10Be show consistently longer cycles with well-defined periodicities and varying amplitudes. Current models of solar activity assume that the origin and modulation of solar activity lie within the Sun itself; however, correlations between direct solar activity indices and planetary configurations have been reported on many occasions. Since no successful physical mechanism was suggested to explain these correlations, the possible link between planetary motion and solar activity has been largely ignored. Aims. While energy considerations clearly show that the planets cannot be the direct cause of the solar activity, it remains an open question whether the planets can perturb the operation of the solar dynamo. Here we use a 9400 year solar activity reconstruction derived from cosmogenic radionuclides to test this hypothesis. Methods. We developed a simple physical model for describing the time-dependent torque exerted by the planets on a non-spherical tachocline and compared the corresponding power spectrum with that of the reconstructed solar activity record. Results. We find an excellent agreement between the long-term cycles in proxies of solar activity and the periodicities in the planetary torque and also that some periodicities remain phase-locked over 9400 years. Conclusions. Based on these observations we put forward the idea that the long-term solar magnetic activity is modulated by planetary effects. If correct, our hypothesis has important implications for solar physics and the solar-terrestrial connection. I note three recent papers that find evidence for long-term cycles influencing the Earth’s climate. Weichao Wu of the Peking University and colleagues studied sea-surface temperature records preserved in deep-sea sediments near Okinawa in the Pacific Ocean, and found evidence for multiple cyclic temperature variations over the past 2700 years. The most interesting temperature peaks correspond to medieval, Roman and possibly Minoan warming periods of about 900, 1800 and 2500 years ago. The paper is significant in that it concludes that the current rate of global temperature change lies in the same range as that of those historical warming periods. This suggests we have evidence that challenges current climate orthodoxy on two grounds, first by suggesting that such warming events were global not local European phenomena, and second that current warming is not unprecedented in the historical record. While we read many claims by oceanographers of an increasing rate of rise in sea-levels associated with increased atmospheric carbon dioxide, an alternative interpretation of observed data is made in a recent analysis by Don Chambers of the University of South Florida and colleagues. Chambers poses the question: “Is there a 60-year oscillation in sea-level?” and shows evidence that the answer is probably yes. I would add that if Chambers is right, the accelerating rate of increase in sea-levels has topped out about now, and the 10mm a year rises needed to reach the feared “1 metre rise by 2100” are not going to happen. A third work … is a study by JA Abreu of the prestigious Swiss university ETH, with co-authors including Australia’s 1995 Australia Science Prize winner Ken McCracken. More Massive Winters Expected for the Northern Hemisphere. The coming winter in the Northern Hemisphere looks to be shaping up for another massive event perhaps bigger than what we experienced in 2011/2012. The last winter coincided with the highest level of EUV and FUV since the beginning of SC24 which although low by normal standards the current UV level is trending quite a bit lower. In fact the current level is not far above the SC22/23 minimum. At present the EUV levels are less than half of the values recorded during the peak of SC23. There is strong evidence that low EUV and FUV are major players in determining the jet stream position and strength along with major changes to ozone quantities at different levels of the atmosphere. UV also has an influence on the NH polar vortex which when the conditions are right favoring a negative AO over the winter months. When both of these options come together the greatest effect is felt in the Northern Hemisphere. During the summer in the NH and the winter at present in the SH the mainstream media are picking up the relevance of the jet stream patterns that are occurring. This is a shift from the previous year of not only of the knowledge gained but also of the increased activity of the jet stream through 2012. If this pattern continues into 2013 we should witness some big extremes in weather with blocking highs and masses of cold air feeding from the poles. H/T to a regular leader for this e-mail tip. 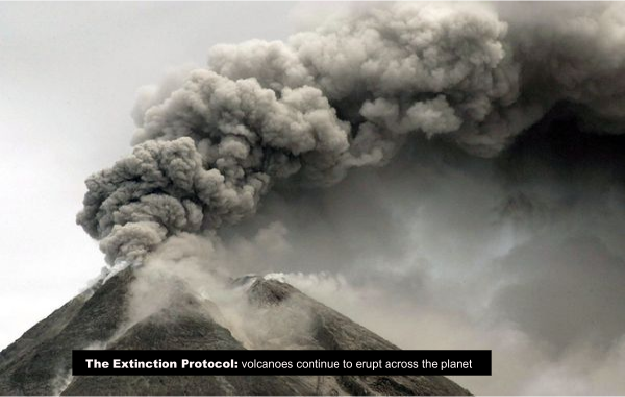 Three giant volcanoes, Shiveluch, Kizimen and Plosky Talbachek, are erupting in different parts of the peninsula simultaneously, causing dozens of local earthquakes as vibrations accompanying the eruptions continue to increase. Over the last days, Shiveluch, the biggest and most active, erupted gases several times while unceasing earth tremors send avalanches down its slopes. Seismic activity at Stratovolcano Kizimen also by far exceeds normal. More than 80 local earthquakes have been registered near the volcano in the last 24 hours. At night a red glow could be seen in the sky above its crater. Kizimen ‘woke up’ in 2009 after the last big eruption in 1928-29 and since then its activity has only been growing. Plosky Talbachek volcano has been erupting lava for weeks now. The flows are glowing in the nighttime, which means that more and more masses of lava continue to arrive, reported Kamchatka Volcanic Eruption Response Team. Aviation authorities have issued an orange security level in the area. H/T to Ice Age Now for this link and a regular reader for an e-mail tip. While a quiet sun can bring cooler climate to the planet, volcano eruptions can make the cold more intense, as the particulates block some of the sun’s energy from reaching the oceans. We are in from a much colder winter. A paper published in Quaternary Science Reviews reconstructs temperatures from ice cores and finds the Greenland ice sheet has cooled about 2.5C over the past 8,000 years. Needless to say, no “tipping point” was triggered as claimed by climate alarmists when Greenland was more than 2C warmer than the present. Time in thousands of years before the present indicated by x axis, temperature anomaly in degrees C indicated by y axis. Fig. 6. Temperature reconstruction at the Agassiz (blue) and Renland (red) ice caps are obtained by correcting the uplift corrected δ18O from AR (Fig. 5), for changes in the ocean’s δ18O content and applying the °C/δ18O slope of 2.1 ± 0.2 °C/δ18O. The original temperature reconstruction for the whole Greenland region from the Vinther et al. analysis is shown in black. Ice core records were recently used to infer elevation changes of the Greenland ice sheet throughout the Holocene. The inferred elevation changes show a significantly greater elevation reduction than those output from numerical models, bringing into question the accuracy of the model-based reconstructions and, to some extent, the estimated elevation histories. A key component of the ice core analysis involved removing the influence of vertical surface motion on the δ18O signal measured from the Agassiz and Renland ice caps. We re-visit the original analysis with the intent to determine if the use of more accurate land uplift curves can account for some of the above noted discrepancy. To improve on the original analysis, we apply a geophysical model of glacial isostatic adjustment calibrated to sea-level records from the Queen Elizabeth Islands and Greenland to calculate the influence of land height changes on the δ18O signal from the two ice cores. This procedure is complicated by the fact that δ18O contained in Agassiz ice is influenced by land height changes distant from the ice cap and so selecting a single location at which to compute the land height signal is not possible. Uncertainty in this selection is further complicated by the possible influence of Innuitian ice during the early Holocene (12–8 ka BP). Our results indicate that a more accurate treatment of the uplift correction leads to elevation histories that are, in general, shifted down relative to the original curves at GRIP, NGRIP, DYE-3 and Camp Century. In addition, compared to the original analysis, the 1-σ uncertainty is considerably larger at GRIP and NGRIP. These changes reduce the data-model discrepancy reported by Vinther et al. (2009) at GRIP, NGRIP, DYE-3 and Camp Century. A more accurate treatment of isostasy and surface loading also acts to improve the data-model fits such that the residuals at all four sites for the period 8 ka BP to present are significantly reduced compared to the original analysis. Prior to 8 ka BP, the possible influence of Innuitian ice on the inferred elevation histories prevents a meaningful comparison. See more supporting graphics at THE HOCKEY SCHTICK: New paper shows Greenland has cooled ~2.5C over past 8,000 years. RT has more pictures HERE. Sadly, most climate scientists fail to study or understand the geologic history of climate, which has led to countless false claims that today’s climate is unnatural, extreme, unusual, or unprecedented. 1. Climate is in continual flux: the average annual temperature is usually either rising or falling and the temperature is never static for a long period of time. 2. Observed climatic changes occurred over widespread areas, probably on the global scale. 3. Climate changes must be judged against the natural climatic variability that occurs on a comparable time scale. The Little Ice Age, Medieval Warm Period, and similar events are part of this natural variability. These events correspond to global changes of 1 – 2 C.
4. Global temperatures appear to be rising, irrespective of any human influence, as Earth continues to emerge from the Little Ice Age. If the temperature increase during the past 130 years reflects recovery from the Little Ice Age, it is not unreasonable to expect the temperature to rise another 2 to 2.5 degrees Celsius to a level comparable to that of the Medieval Warm Period about 800 years ago. The Holocene Epoch, as a whole, has been a remarkably stable period with few extremes of either rising or falling temperatures, as were common during Pleistocene glacial and interglacial periods. Nevertheless, the Holocene has been, and still is, a time of fluctuating climate. 5. Climatic changes measured during the last 100 years are not unique or even unusual when compared with the frequency, rate, and magnitude of changes that have taken place since the beginning of the Holocene Epoch. Recent fluctuations in temperature, both upward and downward, are well within the limits observed in nature prior to human influence. A new paper published in Climate of the Past reconstructs temperatures in Switzerland from 1444 to 2011 on the basis of grape harvest dates and finds temperatures were about the same as today at the beginning of the record around 1450 AD, and that temperatures of today have been matched or exceeded several times in the past. In addition, the paper finds European temperatures during the summer of 1540 were 4.7 °C to 6.8 °C higher than those of 2003, causing more extreme heat & drought than the “record breaking” heat & drought of 2003. More details at the Hockey Schtick. Grapes are very sensitive to the climate, requiring a number of degree days to mature and generate the sugars need to make good wine. Short season, bad wine. Long season, better wine. I can see the Maunder Minimum in the graphic, but having a harder time seeing the Dalton Minimum. For years, researchers have puzzled over why Viking descendents abandoned Greenland in the late 15th century. But archaeologists now believe that economic and identity issues, rather than starvation and disease, drove them back to their ancestral homes. More HERE. The authors describe life on Greenland during the LIA. It was a brutal existence for those on the island, isolated from their homeland.